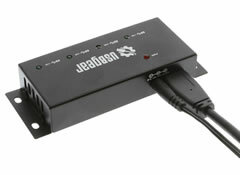 Slim 4-Port USB 3.0 Mini Super-Speed Hub with Power Adapter and 3ft. USB 3.0 cable included to connect your USB peripherals 40 times faster. 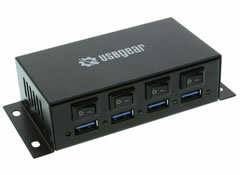 Constructed with a metal case and base mount flanges, the surface mount USB 3.0 hub includes high current 4000ma power adapter UL and FCC listed Ultra Fast GL 3520 CHIP, USB.org Certified USB 3.0 4 port Hub. Slim and rugged 4-Port USB 2.0 Mini High-Speed Hub with 18 inch USB 2.0 type-A male to Mini-B Male cable included. The metal case is with mounting flanges and holds to the USB 2.0 specification standards supporting high-speed data transfer at 480Mbps and backward compatible with USB 1.1 full speed of 12Mbps. This product has been designed to be connected to a computer with a USB 2.0 interface. It serves to connect up to 4 additional USB devices. The USB 2.0 Mini high speed hub is bus powered but can be self-powered with an additional 5V AC power adapter sold separately. 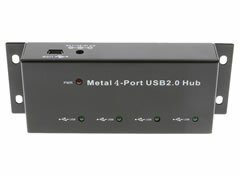 The USBG-4P3SW Hub is designed to allow its user to have more control over the USB 3.0 downstream ports by incorporating an on/off switch into its operational interface. Each of the USB ports can be operated individually and offers 1.5A protection per port. The switchable USB 3.0 4-Port Hub is mountable for applications and is backward compatible with USB 2.0 High-Speed and USB 1.1 Full-Speed data transfer rates. Mounting places may be any flat surface such as walls, table tops, or under desks however, this hub is only to be used in an indoor environment and is not meant for use outside an enclosed area.